is published as a newspaper and public forum by UCO students, weekly during the academic year, at the University of Central Oklahoma. The issue price is free for the first copy and $1 for each additional copy obtained. 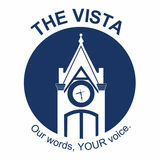 Opinion columns, editorial cartoons, reviews and commentaries represent the views of the writer or artist and not necessarily the views of The Vista Editorial Board, the Department of Mass Communication, UCO or the Board of Regents of Oklahoma Colleges. The Vista is not an official medium of expression for the Regents or UCO. The Vista encourages letters to the editor. Letters should address issues and ideas, not personalities. Letters must be typed, double-spaced and must include the authorâ&#x20AC;&#x2122;s printed name, major, classification and phone number. Phone numbers are included for contacting purposes only. Letters are subject to editing for libel, clarity and space, or to eliminate statements of questionable taste. The Vista reserves the right not to publish submitted letters. 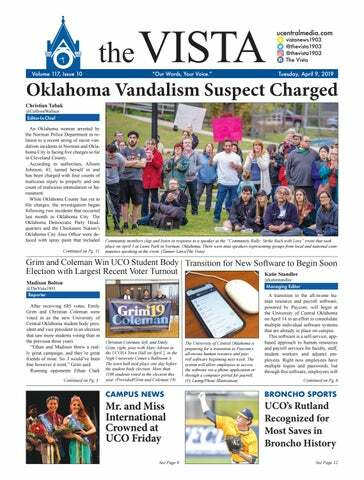 Editor, The Vista, 100 N. University Dr. Edmond, OK 73034-5209, or deliver in person to the editor in the Communications Building, Room 131. Letters can be emailed to thevista.ads@gmail.com. said. Vu has participated in and directed numerous UCO pageants in the past. She said she enjoyed the aspect of mentoring young men and women and that witnessing the growth from the first day to the last day is something amazing. “What I loved about directing the International pageant was the diversity and the astounding organizational support of each country,” Vu said. “It was incredible listening to the cheers and support they had for their representative.” Han and Espinoza both received a $1,600 tuition waiver for winning the crown, along with a sash. There were 10 female and five male contestants in this year’s pageant. There was representation from Bolivia, China, Denmark, Haiti, India, Korea, Malaysia, Myanmar, Nepal, Nicaragua, Pakistan, Peru and Vietnam. munication at UCO, prefer to avoid the use of racial euphemisms in most situations. “The best policy is to eliminate race unless it is pertinent to the story," Faulkner said. "It’s what AP has recommended for years. In stories that are about diversity or racial issues, reporters should ask the individual how they wish to be identified. For Native Americans, it is better to identify someone as Cheyenne, if possible, rather than the broader term." Also in the update, AP is eliminating the hyphen American in reference to those with dual heritage. According to Poynter, the hyphen dates to the 19th century as a way to distinguish immigrants as “others” and has been a common microaggression for more than a century. Edmond resident Kevin Nguyen says the hyphen emphasizes differences in a time where we should focus on similarities. "I could see where having hyphenated heritage would make someone feel like they don't have the same right to be here as a person without the hyphen," Nguyen said. In 2002, a group of Asian American journalists from the San Francisco Bay Area started the magazine, Hyphen, a publication that covers Asian American community activism, politics and non-mainstream culture. “Overall, it would be nice to live in a world where racial references simply indicate a rich cultural heritage rather than a designation as 'other,'" Faulkner said. "Maybe someday we’ll reach that point." Reception Room for for students who had their work published in the New Plains Student Publishing’s The Central Dissent. Wednesday, April 10, 2019 I Ask for Consent: The Peer Health Leaders are hosting an awareness event for consent and supporting survivors of sexual assault from 11 a.m. to 1 p.m. at the Clocktower by Broncho Lake. BronchoThon Blood Drive: The Office of Student Engagement is hosting a blood drive with the Oklahoma Blood Institute for BronchoThon from 10 a.m. to 3 p.m. in the Nigh University Center’s Mary Fallin Room 304. African Student Association General Meeting: The African Student Association will host a general meeting from 4-6 p.m. in Nigh University Center Room 314. TED in the Park: The TEDxUCO student organization is hosting a TED in the Park event from 6-8 p.m. in Plunkett Park. The event will feature TED videos and give students the opportunity to learn more about TEDxUCO on campus. ademic year. Bystander Intervention Training: The UCO Peer Health Leaders are hosting bystander intervention training from 12-1:30 p.m. in Thatcher Hall Room 343. The training will provide students instruction in how to intervene in situations where they are concerned about the well-being of friends and family. Alumni Panel - What I Wish I Knew When I Was In College: UCO’s chapter of the Phi Alpha Theta history honor society is hosting a panel of alumni from 6-7:30 p.m. in the Nigh University Center’s Will Rogers Room 421. The event is STLR tagged in the Health and Wellness tenet. Hello Vietnam: The Vietnamese Student Association will host Hello Vietnam, a celebration of Vietnamese culture from 6:30-8:30 p.m. in the Nigh University Center’s Constitution Hall. The event will feature activities including traditional dancing, singing and food. Barre For The Kids: UCO’s chapter of the Alpha Gamma Delta will host a barre class for UCO and the Edmond community from 7-8 p.m. at Plunkett Park. Robert S. Kerr Room 301. The proceeds of the event will be donated to UCO’s annual BronchoThon charity fundraiser. Chill Skills: This group works to reduce conflict in your life: identify triggers, patterns and purpose of anger; gather more tools for enhancing communication, boundaries and healthy relationships. The group meets from 9:30-10:30 a.m. in Nigh University Center Room 322. LGBTQ Support: From 1-2 p.m. in Nigh University Center Room 322, the Center for Counseling and Well-Being will host a support group for those considering coming out as lesbian, gay, bisexual or transgender, and those who have recently come out. Anyone who identifies as LGBTQ, is questioning or unsure can meet and talk about various topics. A Life Worth Living: This group works on skills for improving boundaries and strengthening healthy relationships, enhancing sense of self and ways to manage distress. The group meets from 2-3 p.m. in Thatcher Hall Room 328. UCO Softball vs SW Baptist: The UCO Bronchos softball team will face off against the Southwest Baptist University Bearcats from 3-7 p.m. at the Broncho Softball Stadium. Cosi Fan Tutte: UCO Opera will host a rendition of Wolfgang Amadeus Mozart’s famous opera, Cosi Fan Tutte, 7:30-8:30 p.m. in the Mitchell Hall Theater. and Madison Stueve finished the race with 447 votes. Overall this was over 1,000 votes in this years student body election, and according to UCOSA is the highest voter turnout they’ve seen within the last few years. “I was very much in shock when they first told us, I definitely cried a little,” Grim said. “I had been thinking about this and working toward it since I came to UCO, and the fact that it worked out the way that I was hoping for the last two years is absolutely insane!” Voting for the UCO Student Association election took place on April 3 and Grim and Coleman were campaigning on campus all day, from 9:00 a.m. to 5:00 p.m. “Really, the students and their concerns and well-being kind of motivated me to push through, in dress shoes, from 9:30 [a.m.] to basically 5:00 p.m.,” Coleman said. Over the past month, the University of Central Oklahoma Student Association has seen six bills reach the legislative floor, with five passing. These bills have touched on major campus issues such as the recent UCOSA elections and the funding of campus organizations. On April 1, UCOSA had their 8th meeting of the semester and passed bill CR19-210. Due to the bill not originally being on the docket, Chair of Congress Tate Atkinson, Vice Chair Jordan Medaris and Secretary Emily Grim left the room while Senator Kailey Kelpine led the rest of the senators to vote the bill into the agenda so it could be passed, as it was time sensitive. The bill passed unanimously. CR19-210 gave $933 to the Students Sustainability Summit that was on April 3, which was sponsored by the UCO Office of Sustainability. UCO Green is an on-campus organization that says they prioritize social justice, healthy environments and strong economies. “Through active programming, infrastructure and processes upgrades that take economic and environmental concerns into consideration, and solutions founded in evidence-based research, we strive to make the UCO campus...a more sustainable place,” UCO Green said. speaker come to campus. CR19-205 was also proposed on March 25, but it was killed as the authors did not want it to be presented anymore. The bill was about putting a question about an increase of seven dollars to the Student Activity Fee on the student body elections ballot. The next UCOSA meeting will be at 4:30 p.m. on April 15 in the Nigh University Center’s Will Rogers Room 421.
use it. Recently, Griffin said Paycom released their Direct Data Exchange, the industry’s first comprehensive management analytics tool, which gives employers insights into efficiencies gained through employee usage of human resource technology. “Our software allows organizations like UCO to be more efficient, while also creating engagement opportunities with its biggest asset – its employees,” Griffin said. Starting Monday, Paycom University can be accessed online for all UCO employees to start online tutorials before the transition begins. Paycom University can be accessed through the Paycom self-service portal either on a computer or through the Paycom app. school diploma, clear career path and a strong interest in German and world affairs are able to apply. Once the person completes the program, they are forever an alumnus to the CBYX-YP, where they are able to communicate and network with others that have gone through this program. “I can’t wait to represent not only UCO, but my tribe as well when I am over there,” Fields said. All 75 Americans will have the opportunity to meet German government officials while they are there. because he has had experience with American government in Washington D.C.
by local vendor Eskimo Sno. “Tonight the Norman community came together. We cried. We hugged. We laughed. WE RALLIED,” Clark wrote on her Facebook page. Johnson had her first court appearance in the Cleveland County Court on Monday and it remains to be seen if Oklahoma County will press additional charges in relation to its own vandalism cases. son in school history. Rutland only trailed Russ, who in the 2017 season recorded 15.
nine saves lead all pitchers in NCAA Division II. “The defense helps out a lot and I just feel like I can control all my pitches,” Rutland said. “I’m able to spot up and locate.” Rutland said he is not the type to study batters before the game to gain an advantage. He just goes out and throws how he knows how to throw. The Bronchos are 20-13 on the season and 12-9 in conference play. “It’s been great,” Rutland said on his time at UCO. “I love it, we’ve got a family going here and hopefully [will be] able to go pretty far this year.” UCO will continue their road stretch as they face off with the Oklahoma Christian University Eagles at 5 p.m. on Wednesday. ror by the Lindenwood first baseman Dominic Revetta and both Massner and Black scored on the play, giving UCO a 2-0 lead in the game. Brayden Nelson got the win for UCO in his second start of the season. The junior moved into the rotation and is now 3-0. Nelson threw seven innings Saturday, striking out two along and allowing three hits and two walks. ble of his own. UCO is 20-13 following the series and 12-9 in Mid-America Intercollegiate Athletics Association play and will next turn their attention to a non-conference matchup. The Bronchos will travel to Oklahoma City to take on Oklahoma Christian University on Wednesday before hitting the road for an MIAA series. UCO will visit Northeastern State University for three games in Tahlequah April 12-14.
with a player like the Greek Freak. Toronto Raptors: The Raptors are quietly having one of their best seasons yet. While they’ll finish with fewer wins than last year, the addition of Kawhi Leonard offers a tremendous amount of playoff experience. After being swept by Lebron and the Cavaliers in last year’s playoffs, the Raptors decided to make changes. Not many teams with the second-best record in the league would fire their head coach, who won Coach of the Year, and trade their franchise player for an injured diva, but that’s exactly what Toronto did and it seemed to pay off. The Raptors are the two seed in the East, and what they lack in skill, they make up for with experience and Kahwi Leonard, of course. While players like Antetokounmpo and James Harden are the stars in the regular season, look for Leonard to shine in the postseason. Houston Rockets: While the Denver Nuggets had a terrific regular season, and will most likely finish as the two-seed ahead of the Rockets, Houston would be my pick if anyone is going to take down Golden State. The Nuggets are the deepest team in the NBA, but they lack certain firepower that only James Harden can provide. In their season series versus Golden State, the Nuggets went 1-3, losing each game by an average of 20 points. The Rockets defeated the Warriors 3-1 in their series. If James Harden can continue his historic play into the postseason, they may have a chance to take down the Warriors. Milwaukee Bucks: With the most wins in the NBA and an MVP favorite, there would be no surprise if the Bucks found a way to win the NBA Title. They are clearly, when healthy, head-and-shoulders above all other teams in the East, so it’s Finals or bust. Toronto Raptors: After firing the coach of the year, Dwayne Casey, and trading away their franchise player for a potential one-year rental in Kawhi Leonard, they have to at least get to the Finals. I think the pending future hanging over their heads will motivate this team to play at their best potential. Golden State Warriors: An easy pick, it’s no secret that this team is most talented and has the most playoff experience as they have won three out of the previous four championships. In their final season in Oakland, the season would be a failure if the three-peat did not happen. Oklahoma City Thunder It’s hard to pick anybody to come out of the West besides the Warriors, so I have to take the homer route here. I think if any team knocks off Golden State it will be the Thunder – and wouldn’t that be a miracle. Ok, let’s stop dreaming, the actual Finals will be the Milwaukee Bucks vs. the Golden State Warriors with the Warriors winning it all again in six games. I think the Warriors, barring injury, is too much to handle for any team in a seven-game series. Golden State Warriors: The rightful favorites, the two-time defending champions have no reason why they can’t three peat as long as the trio of Steph Curry, Kevin Durant and Klay Thompson show up. While their bench is weaker than previous years, the Warriors still have enough to win it all. Toronto Raptors: My favorite to come out of the East, the Raptors have a complete roster playing great basketball down the stretch. With Boston having chemistry issues and Philadelphia lacking shooting, the Raptors should punch their ticket to the finals. Houston Rockets: This pick hinges on two things: James Harden showing up and the inexperience of the Denver Nuggets. Sure the Rockets live and die by the three, but you can only help but wonder if they see last year’s game seven as a missed opportunity - one I don’t see them missing this year. Brooklyn Nets: Just like my counterpart, I’m taking a wild card here too, although mine is out there. Hear me out. The Nets weren’t supposed to be in the playoffs. They weren’t even supposed to win 40 games, yet here they are. As not only a fan but a die hard one I know they can make some noise. When it’s all said and done, the Golden State Warriors will emerge as the NBA champions after a tough six game series against the Raptors. 3-for-3 at bat, while Bailey Thompson, Haley Pomplun and Brighton Gilbert all followed with two hits each. Game two of the doubleheader was a closer game, however, UCO still got the win. Hazel Puempel homered in her first two at-bats and drove in four runs to end the day on a 9-5 win to complete the sweep of Northeastern State. The Bronchos hit the ball 11 times in the second game, led by Lexy Dobson hitting 3-for-4, Puempel following with 2-for-2 and Carli Jones adding a solo home run in a two-hit outing. Sydney McLeod improved to 13-2 as she got the pitching win, giving up three runs in the first five innings before Lauren Gibson threw the final two innings. The Bronchos improved to 31-3 on the season and 13-1 in conference play. UCO returns home Friday to host conference rival Southwest Baptist University for a 3 p.m. doubleheader.